Will it cost anything to get an estimate? No. Mr. Mobley will provide a hand written estimate. 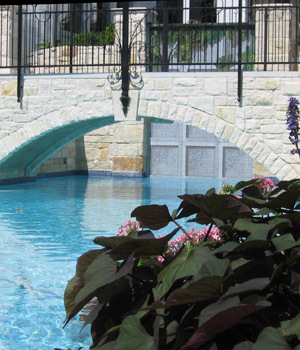 This estimate will outline how we propose to build your pool. Typically, it takes four to six weeks to build your pool. There are many factors such as the size and shape of your pool. Your jobsite accessibility and weather will also play a role. Mobley Pool Co. works with all local banks for your convenience. Will your company help me with my Home Owners Association and/or permit? Yes. We will make sure that all the necessary paperwork gets taken care of. If a permit is required Mobley Pool will do all necessary paperwork to obtain the permit and cover any associated cost. Will there be a job superintendent assigned to my project? Owner Mr. Mobley oversees all construction personally. Let us help you design your backyard oasis! Do you offer a pool cleaning service? Yes. We have a fully staffed pool maintenance department. Whether it’s weekly maintenance or an occasional one time clean, we can take care of all of your needs. *Do I need to do any thing to my pool once I have weekly maintenance with Mobley Pool Co.? Yes. There are a few things we do ask of our customers. Please keep the water level up in your pool. We also ask that you check skimmer baskets during the week to help with pool circulation. Many times in the fall months we have a lot of leaves that will fall and a skimmer basket can fill in over a 24 hr period of time. Why is my pH so high? All of the water in the Bryan/College Station area whether from a private well or from a municipality has a high PH. What is that white film that grows on my tile? It is sodium deposits that come from the high sodium source water in the Bryan/College Station area. The best way to prevent it is by maintaining the pH at proper levels and using a sequestering agent monthly. What does it mean when a pool is “balanced”? Why is my pool growing algae? Algae can grow if any of the following three things happen; Chlorine gets too low, pH gets to high or the water circulation is poor. This is more likely to occur after rain or heavy use. What is a salt pool? A salt pool is a pool in which the sodium level has been raised above normal levels and has been fitted with special equipment that converts the salt in the pool into chlorine.